Patient outcomes are directly related to surgeon experience. It is not uncommon for patients preoperatively to be concerned about their postoperative quality of life as it relates to urinary symptoms. The data above demonstrates that more patients report a higher satisfaction with their urinary symptoms after prostate removal due to relief of obstructive symptoms. 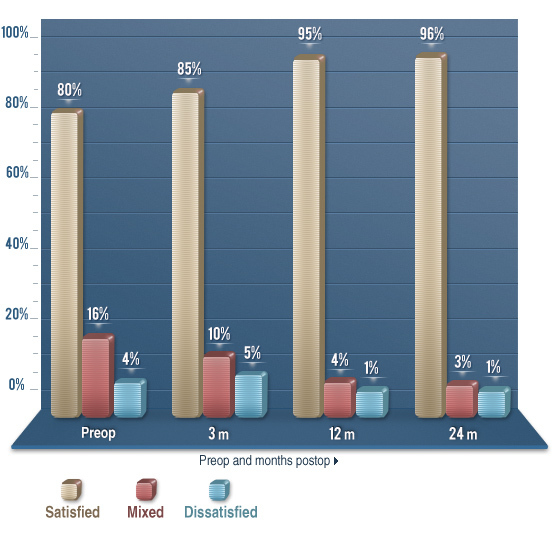 96% of patients are satisfied with their urinary quality of life 2 years postoperative compared to 80% preoperative.